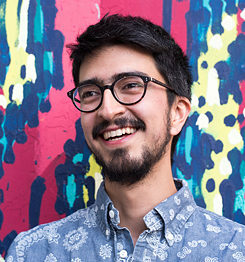 Carlos Andrés Rico, born in 1986, studied composition in Bogotá and worked several years there as content producer and presenter for cultural radio. Since 2011, he lives in Hamburg where he took a Master’s degree in multimedia composition with Georg Hajdu and Manfred Stahnke. © Athina Pontikou In 2016, he founded "Selva", the first festival for experimental short films, performance and music from Ibero-America in Hamburg. This festival offers a fresh perspective on Latin America, Spain and Portugal, and goes further than the folkloristic perceptions commonly associated with these regions. Currently he is a Doctor of Music candidate with the subject Music Intervention in Public Spaces as Strategy to promote Social Integration at the Hamburg University of Music and Theater. Nowadays he is an active composer in the field of music and social integration through different projects with local communities and with the Ibero-American Network of Musicians and Artists (RIMA), which unites Latin American and European artists and organises events in Germany. As a musician, he leads "Sedah Hajusom", a music ensemble of young people with migrational backgrounds that mixes traditional melodies with rap and electronic beats. With his music interventions, Carlos Andrés Rico transforms daily sounds, places and interactions into art by constructing a new soundscape, a new territory which results from the symbiosis between music, performance and the city. His project goes beyond frontiers, producing new citizen's subjectivities and a recreational relationship with the public space, through a work that can become part of the city and of the experiences of the human beings who inhabit it. During the bangaloREsidency@Maraa he plans to invite local artists to participate in a series of radio works about culture and public space in order to develop an intervention for the streets of Bangalore collectively. As years have passed and while I was immersed in contemporary music composition, I discovered a great interest in the possibility of creating works that could be presented in public spaces. Now back in Hamburg after two months stay in Bangalore I believe that the bangaloREsidency is one of the best opportunities I had until now to explore this interest and to confirm the possibility to use public space as a place for artistic creation in order to promote favorable co-existence among citizens of different ages, social classes and beliefs. There are two main reasons to believe that: one is the great support, financial and organizational, that the Goethe-Institut / Max Mueller Bhavan gives to the project of each artist. You arrive in a new city and you already have all you need to start working, including a network of artist or people that may be related to your project. Not to forget that is not always easy for an artist to find the opportunity to focus for two months almost completely on one project. The other reason for me to kind of praise the bangaloREsidency is the host I had the opportunity to work with, Maraa, Media & Arts Collective. Simply the best host I could have wished for. Not just because of their huge hospitality but because they deeply inspired me to follow the path of using artistic creation almost as a strategy to promote inclusion, social justice, fearless listening and to promote a democratic usage of and access to public spaces. ATTENTION this is not censored was the project we developed together, in collaboration with Madhuri and Jagdeesh from MoonArra, Parmita Mjukerjee, Veecheet Dhakal from Gauley Bhai and Narayanswamy. After several rehearsals (or jams) this project culminated in two performances, one at the Goethe-Institut Auditorium and one in open space at the awesome Cubbon Park. Seeing such a diverse and unaware audience, curiously listening, gave me immediately the sensation that I was in the right place exactly at the right moment. For me an unforgettable experience. Also, following from the hardworking spirit of my host we planned to record the music we developed and release an EP (that ended up being an LP). 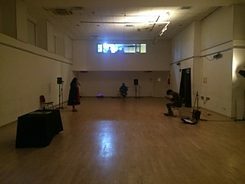 Recorded and Mastered by Christopher Burchell is it possible to listen and download for free at: https://maraa.bandcamp.com/album/attention-this-is-not-censored I would like to end this final report thanking all the team at the Goethe-Institut / Max Mueller Bhavan, my host Maraa, my lovely family in Bangalore Tasqeen, Jason and Asad, and all musicians. They make this project possible and this residency a great and fun two-month stay in Bangalore.